This is what I made for dinner last night. It's a little bit of work to chop up all those herbs, but totally worth it. Even after I was full of herby, cheesy, linguine goodness, I had to step out of the kitchen for fear that I would eat all the leftovers. 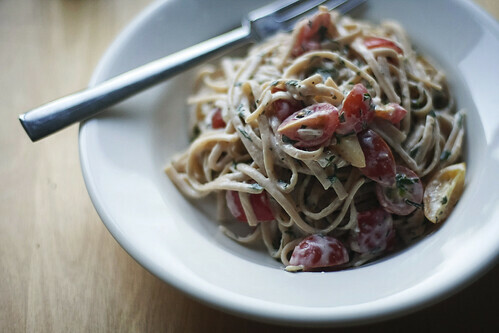 The only modifications I made to the recipe were to use whole wheat pasta and using homegrown tomatoes from the garden* since the store didn't have any heirlooms. Super delicious. And many thanks to miss Shutterbean for reading Rachael Ray's magazine (and finding tasty recipes) so I don't have to! Totally unrelated, but I'm really liking some of the new fall Dansko styles, especially the Rory. I have a feeling I'm not alone in this, because Zappos is completely out of this style in black. When/if they come back in stock I may have to order a pair. They're not something I'd normally pick out, but I love the slightly retro thing they've got going. They'd be the perfect excuse to wear dresses and skirts and colorful tights this fall. *Garden = the large pot of cherry tomatoes that someone planted near our front door. They're ripe and nobody else is picking them so I think they're fair game! \n\n\nThis is what I made for dinner last night. It's a little bit of work to chop up all those herbs, but totally worth it. Even after I was full of herby, cheesy, linguine goodness, I had to step out of the kitchen for fear that I would eat all the leftovers. The only modifications I made to the recipe were to use whole wheat pasta and using homegrown tomatoes from the garden* since the store didn't have any heirlooms. Super delicious. And many thanks to miss Shutterbean for reading Rachael Ray's magazine (and finding tasty recipes) so I don't have to!\n\nTotally unrelated, but I'm really liking some of the new fall Dansko styles, especially the Rory. I have a feeling I'm not alone in this, because Zappos is completely out of this style in black. When/if they come back in stock I may have to order a pair. They're not something I'd normally pick out, but I love the slightly retro thing they've got going. They'd be the perfect excuse to wear dresses and skirts and colorful tights this fall.\n\n\n*Garden = the large pot of cherry tomatoes that someone planted near our front door. They're ripe and nobody else is picking them so I think they're fair game!